Why do they always insist on you using a number 2 pencil? Most modern pencils have a core made of a mixture of graphite and clay. The word pencil comes from the Latin word penicillus, meaning a little tail. In the 1500s, it was called plumbago, Latin for lead ore, because it was thought to be a form of lead. Consequently, the pencil core is still referred to as pencil lead, even though it never contained the element lead. Ironically, until about a half century ago, lead poisoning from pencils was possible due to the use of lead paint for the outer coat. This paint then could be ingested when the pencil was bitten or chewed. 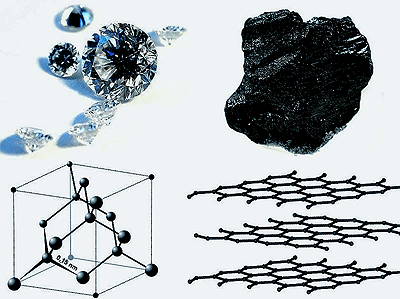 Graphite is a mineral that is an allotrope of carbon (on the right, below). Allotropes are pure forms of an element that differ in structure. Graphite is carbon laid out in slippery sheets. Diamond (on the left, below) is carbon bonded into a rigid structure. Graphite was named in 1789 by Abraham Werner from the Greek word grapho, meaning to draw or to write. Unlike diamond, graphite is a conductor of electricity. Because of this property, it is useful as electrodes in arc lamps and batteries. The development of the modern pencil started in the 16th century, when a large deposit of graphite was discovered in England that was very pure and solid enough to be cut into sticks and used for marking sheep. But because graphite is soft, the graphite sticks were wrapped in sheepskin or string for neatness and to prevent them from breaking apart. Shortly afterward, an Italian couple named Bernacotti, in an effort to improve the overall design, had started hollowing out sticks of wood and inserting graphite sticks into them. In 1795, Nicholas Conté discovered a procedure of mixing powdered graphite with clay to form rods that were then baked in a kiln. Conté discovered that by changing the ratio of graphite to clay, he could change the hardness of the pencil rod. The greater the amount of graphite, the softer the rod and the darker the pencil mark as it deposits more graphite onto the paper. The greater the clay, the harder the rod, the lighter the mark. 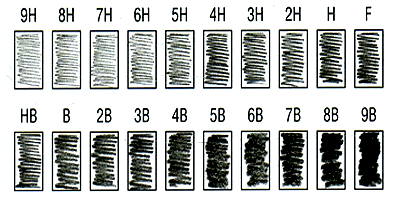 Conté created a numbering system for grading pencil hardness. He started at 1 and higher numbers indicated softer rods. Incidentally, this procedure of mixing graphite and clay was developed independently in the US in the 1800s by the father of Henry Thoreau, John Thoreau. His grading system, however, used higher numbers to designate, instead, harder rods. This 1-4 numbering system by Thoreau is still used in the US today. For the rest of the world, most of the pencils are graded on the European HB system developed in the early 20th century by Brookman, an English pencil maker. It allows for a greater selection of graphite-to-clay ratios by using a continuum from H (for hardness, or increasing clay) to B (for blackness, or increasing graphite). The grade HB is at the middle of this continuum, offering a balance between erasability (graphite) and durability (clay). You want a pencil mark to be reasonably easy to erase without ripping a hole in the paper, but not so soft and dark that it smudges all over. Consequently, the standard writing pencil is graded HB… or… wait for it… number 2.